- Publisher This self-study guide to the prophetic books of Ezekiel and Daniel will introduce you to God-given visions and messages that pertain not only to Israel at the time of writing, but also to us in our time. If you are interested in prophecy, Ezekiel and Daniel are a choice place to begin your study. These Old Testament books are filled with God-given visions and messages that pertain not only to the situation at the time of writing, but also to the future. This self-study guide outlines Ezekiel's warnings against the ungodly as well as the eternal promises God gives to those who seek to glorify Him. You will see God's sovereign hand at work through the prophet Daniel, whose devotion was in evidence through every trial and test.The books in the Jensen Bible Self-Study Guide series are designed to provide you with a broader understanding of God's Word. Offering historical context and background, author information, charts, and other helps, these books will equip you with a comprehensive reference tool you'll return to often. Each study includes an opportunity for analysis, response, and further study in a response-oriented format. The thirty-nine books in this series are suitable for both personal and group use. 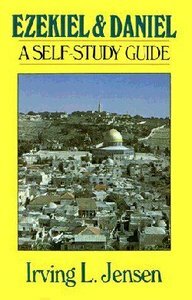 About "Self Study Guide Ezekiel & Daniel (Self-study Guide Series)"
This self-study guide to the prophetic books of Ezekiel and Daniel will introduce you to God-given visions and messages that pertain not only to Israel at the time of writing, but also to us in our time.